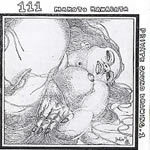 The first release “111” in Kawabata Makoto’s new CDR series has been released by the AMT label. The series itself is called Private Sound Drawing. Each disk contains an individual drawing by Kawabata.